Michael Lewis pours a sample of his Sturgis Shine moonshine before it is distilled down to 100 proof. 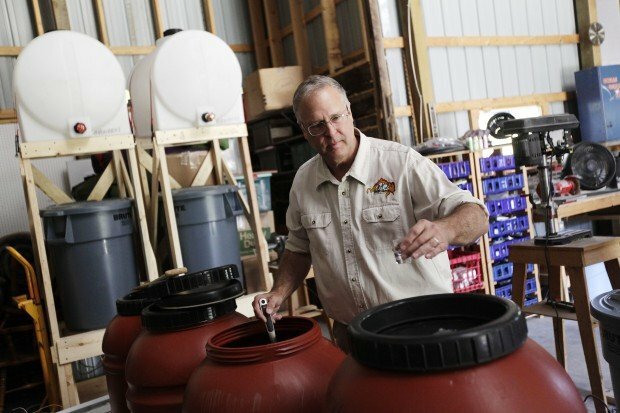 He started Black Hills Dakota Distillery with his brother, Paul, and wife, Joanne, in the garage of their home. The product is made from South Dakota-grown ingredients and bottled by hand. 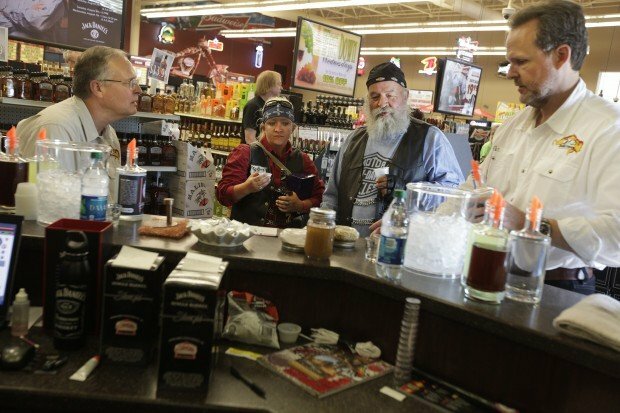 Alexa Kitchens, center left, and Gary Bleasant, sample Sturgis Shine moonshine during a tasting at the Sturgis liquor store. Brothers Michael and Paul Lewis sold their first bottles during the tasting. Michael Lewis explains the distillation process at the Black Hills Dakota Distillery in his home garage. The company specializes in spirits that are uncommon in the present market, he said. Lewis hopes to commercially produce a strawberry and rhubarb vodka and beer schnapps. Black Hills Dakota Distillery's first batch of Sturgis Shine moonshine will be available at the Sturgis liquor store during the rally. The ingredients for Sturgis Shine are basic and produced in South Dakota. From left, clover honey, yeast and barley. Even the water comes from a well near the distillery site. STURGIS | Michael and Paul Lewis' great-grandfather's recipes for whiskey are getting a new life. Their ancestor brought the recipes to America from Ireland when he was a stowaway on a cattle boat. And it inspired the Lewis brothers to create what they say is western South Dakota's first distillery (at least the first legal one, they say). The brothers debuted their first product, Sturgis Shine, this week. The 100-proof Irish moonshine uses barley, clove honey and sugar and is not the usual corn-based moonshine recipes that many people this side of the Atlantic are used to. The brothers are both civil engineers and have taken their love of tinkering to a new business venture that they hope will fill a hole in South Dakota's alcohol market. The artisan distillery sits just next to Michael's home in Sturgis that he shares with the third business partner, his wife Joanne. The large workshop holds several pieces of equipment, and shelves are filled with tools that look to be part of an elaborate science experiment. In the very middle of the shop is their pride and joy: a 50-gallon column still with four refractor plates. Directly in front of the still are two folding chairs. "It takes us all day for us to boil off 50 gallons of wash to six gallons alcohol," Michael said Wednesday, during a tour of their small batch distillery. "It's a bit like watching paint dry." But that is easy part of running this type of business. It took them nearly a year to overcome the toughest part: the permitting. Founded in 2010, they are just now debuting their first product. "It takes a lot of time, and the record-keeping required is through the roof," Michael said. But their goal now is to create unique spirits and flavors by partnering with other businesses and farmers in South Dakota. "Our intention is to come up with unique spirits," Michael said. Everybody has a vodka, everybody has a whiskey. So we want to focus on using South Dakota products to make unique spirits." Some of their ideas include partnering with wineries to distill a type of brandy. They may join with local breweries to make a beer schnapps, and teaming with alfalfa farmers could lead to an alfalfa-based spirit. "Have you ever been out in an alfalfa field? It smells pretty good," Michael said. The brothers aren't sure about how their experiments will all taste, but they know they will have fun. "We're both engineers, and we find that it's fun to try to figure out our alcohol-content yield, using different kinds of yeast and different kinds of sugars," Paul said. "It's cooking, but with only liquids. You can experiment with different recipes and combinations." Last Wednesday, they were on hand in their distillery in an area they hope to eventually turn in to a tasting room. They had an experimental bottle of beer schnapps, an unconventional liquor that boasts an interesting aroma of beer with the burn of liquor. They also had a couple of rhubarb flavor-infused batches of vodka. But the brothers said the most popular way to drink their moonshine was mixed with a bit of sweet iced tea. And that is what their very first paying customer, Keith Ulber from Los Angeles, said made the sale for him. The sale came at The Black Hills Dakota Distillery's first tasting at the Sturgis Liquor Store in downtown Sturgis as many motorcyclists began to arrive for the Sturgis rally on Wednesday. "I liked that it was so versatile," Ulberg said. "I could drink it straight with a little water, but it was great with the sweet tea." Gerry Pleasant of Johnson City, Tenn., said he loved the taste. "It is pretty different," Pleasant said. "I brought moonshine with me, but it's made out of corn."